Ferry operator CalMac is launching a new campaign to reinforce its zero tolerance policy on unacceptable behaviour. Over the past six months staff in ports and on-board vessels have reported a small but worrying increase in incidents of either verbal or physical abuse. 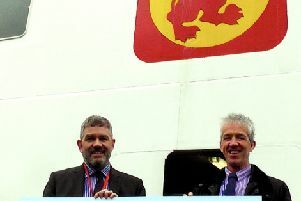 CalMac’s director of safety, environment and security, Louis de Wolff explained why this campaign has now been launched. He said: “Safety of our staff is a priority for us and recently we have seen a small upsurge of abusive passengers behaving in an intolerable way towards staff, this is unacceptable. “With people out and about socialising more over the festive period we felt this was a good time to reinforce the standards of behaviour we expect passengers to have towards our staff. CalMac runs a fleet of 32 vessels across a network of 27 islands and remote mainland destinations on the west of Scotland including Rothesay on Bute. Last year it carried more than five million passengers and 1.2 million vehicles. “Being a lifeline service we understand the importance of our sailings to customers and that they may become frustrated if the service does not go to plan, often because of circumstances outwith our control,” said Louis. “This is never a reason to become abusive or worse. “This is a very small minority of passengers but we feel we need to highlight that we will not tolerate any instance of work related violence, including verbal abuse, to our staff. Other options CalMac has for dealing with customers displaying abusive behaviour include not allowing the customer to board, banning a customer from sailing for a specific time period and requesting the police remove individuals from company premises. Information about what is unacceptable behaviour from passengers will be displayed prominently in ports and on vessels. A new web page outlining examples of real incidents and the consequences of them is also now live. Since 2006 the company’s official name has been CalMac Ferries Ltd although it still operates as Caledonian MacBrayne. In 2006 it also became a subsidiary of holding company David MacBrayne Ltd, which is owned by the Scottish Government.